I noticed this on Twitter today: "We're closer to a Minority Report reality than people realize"
This is certainly true. We are so close that it's already here and have been so for quite a while, at least for most of it. There are generally four different future technologies in that movie (with a slew of sub-techs linking to them, but that's not really important). The first one is the ad tech that is tailored to the individual and is displayed to you as you move around. In the movie, this tech was based on outdoor displays and other physical things, because smartphones weren't really a thing in 2002. So the movie writers envision a future within the media forms that existed back then. But in today's world, the personalized ad experience is already here. Look at things like remarketing, personalized email marketing, Facebook ads or Apple Beacon. This is not the future anymore. This is very much the present. It's here, now! How many times have you seen an ad in an email referring to you by name and offering you products based on your past purchase history? How many times have you seen something on Facebook directly targeted to you? It's not the future anymore. Today, we have this technology as well, and we have taken that a step further. It's now in our pockets and always ready to be used. We no longer need to go into a room to use a desktop computer with a multitouch screen. Imagine if the agents in Minority Report had access to cloud based connectivity and mobile displays. Whole scenes of that movie could have been taken out because it was basically about them going from one room to another to use their computer, or having to physically move data between devices. So, considering that the above quote was told at a media conference to an audience of media people, we are not 'close to a Minority Report reality', we already have it, and we have even taken that a step further in many cases. One might even say that the way things worked in Minority Report is now mostly out of date (although with extremely fancy and futuristic-looking graphics). 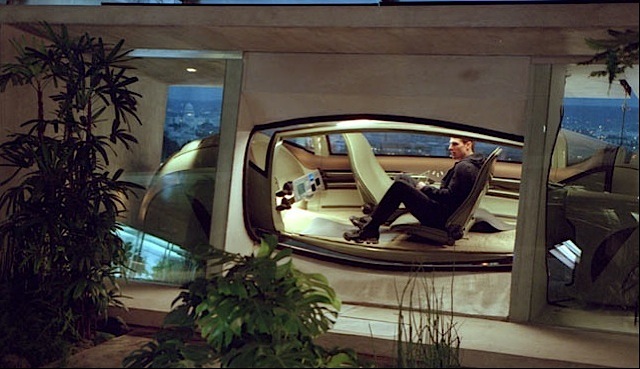 The third tech in Minority Report was the self-driving cars. Now, in this case, it's true that we are only 'close to it'. We are not quite there yet, but it won't be long now before we will have that too. And then we have the fourth tech, the pre-crime tech. In Minority Report they had the ability to see crime before it happened, with enough of a buffer for them to send out the police to prevent it and to put the person in jail for doing it, before that person actually did it. Obviously, this tech isn't here... yet. What may surprise you though, is that we are actually getting close to this as well. Pre-crime in today's world is all about data analysis. In jails, for instance, we now have systems that evaluates the probability of someone committing a crime if they are released. Data that is then taken into account when such a prisoner is up for review. Many police departments use data in many different ways to predict where and when crime is likely to occur, tailoring their work schedule to be in those exact areas during the times with the highest probability for illegal conduct. And these systems are quite advanced. The current tech can define probability within a 500 by 500 foot area, on a real-time per shift basis. Of course, a probability doesn't mean a crime would actually happen, nor is it close to the super specific certainty of what we see in Minority Report. But pre-crime tech? It's here too.